Are your students up for a physical and visual challenge? If yes, this printable yoga worksheet for kids is perfect and it is FREE! 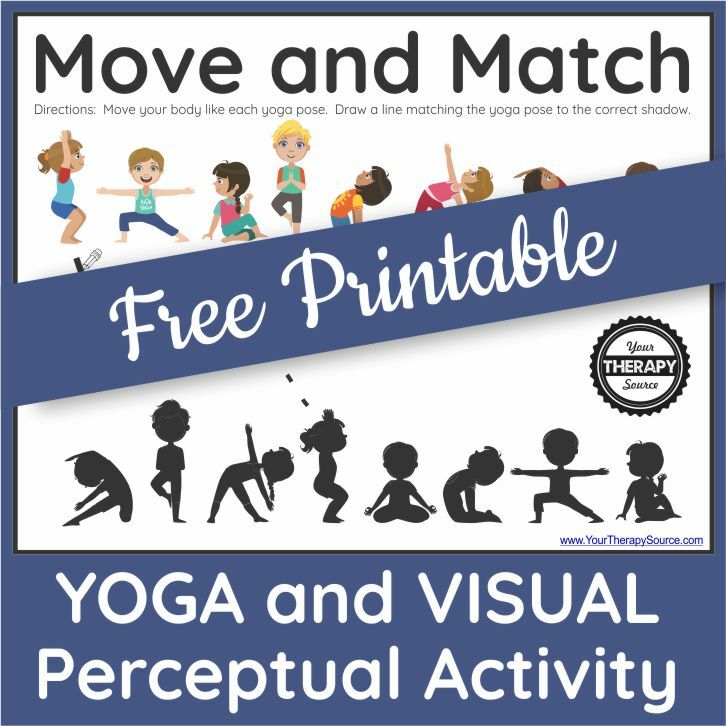 The Move and Match printable yoga worksheet for kids instructs them to move their body like each yoga pose and then draw a line matching the yoga pose to the correct shadow. Download your FREE copy at the end of the post. Pretty awesome huh? All these important motor and visual skills on ONE, NO PREP, worksheet! Woo-hoo! Just print and get moving. 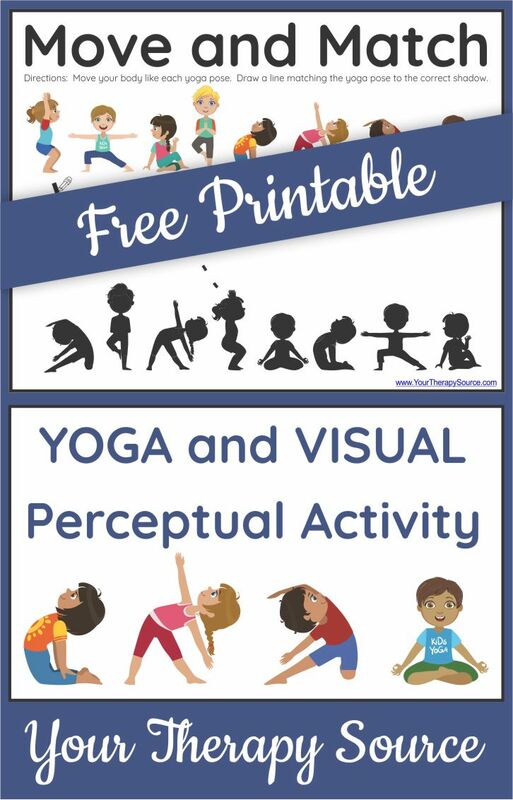 Need Even More Yoga and Visual Perceptual Activities? Check out all of our FUN and EASY yoga for kids activities here. Ready Set Scan – digital download includes 12 visual scanning and discrimination activities. How fast can you scan, find and mark each item? There are 12 challenges in all with different themes including: shapes, animals, fruit, party, travel and babies. Just print and start the search. Follow the directions: start a timer, scan for one object at a time, mark each object and stop the timer. Record your time in the box provided. Dot markers work great for marking the item. Use a different color dot marker for each item. Fading Lines and Shapes – includes worksheets that gradually increase in visual motor difficulty while decreasing visual input for line and shape formation. There are 18 worksheets for line formations ie horizontal, vertical, curves, waves, diagonals, spikes and combinations. There are 9 worksheets for shape formations ie circle, cross, square, rectangle, X, triangle, diamond, oval and heart. This download is great for push in therapy, therapy homework or consultation services in the classroom. Hole Punch Palooza – This download collection includes 26 capital letter strips, 26 lowercase letter strips, 16 pre-writing strips, 12 visual discrimination strips, 4 counting strips, 4 prepositional phrase strips, and 4 hole punch race strips. Once printed, children can trace the letters, write the letters and hole punch the matching letters. All the hole punch strips are in black and white. Hole Punch Palooza encourages: hand strengthening, handwriting, and drawing practice, visual discrimination skills, visual motor skills, right/left discrimination and bilateral coordination. 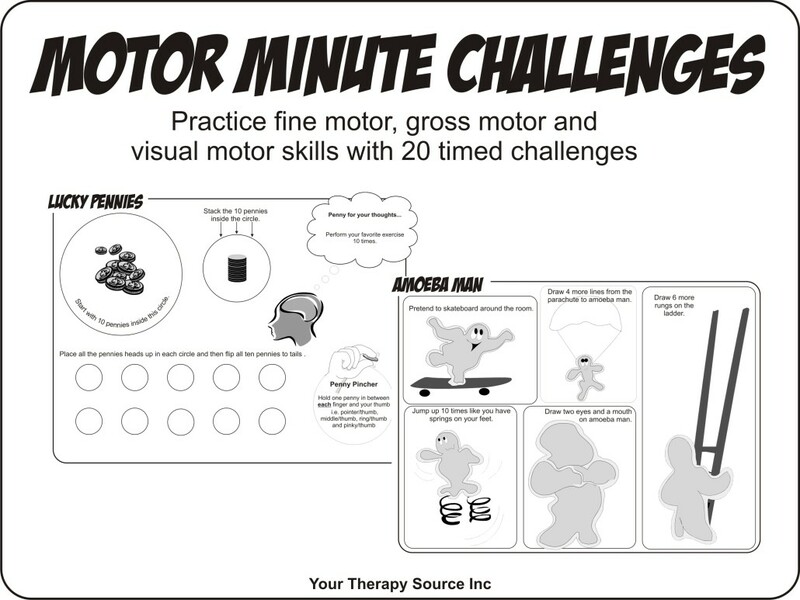 Motor Minute Challenges – digital download includes 20 fine motor, gross motor and visual motor challenges to complete. Complete each challenge sheet by finishing pictures, mazes, physical activities and more. Time the tasks for 1-3 minutes or let the child complete each one at his/her own pace. These pages are great for challenges at home, indoor recess time, rainy day activities and push in or pull out therapy sessions. Sign up to receive the weekly emails and announcements from Your Therapy Source. You will be redirected to the download. School-Based Physical Therapy Services in the United States If Handwriting is Becoming Obsolete Why Do We Care?